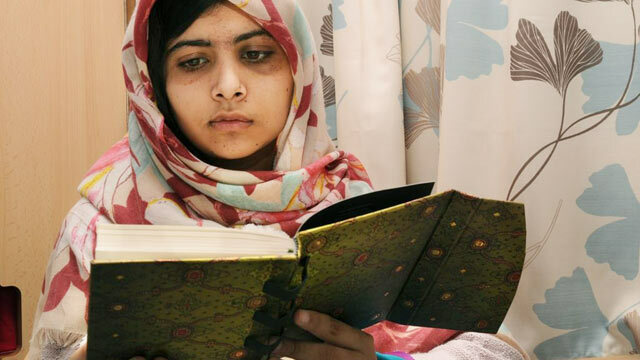 Framing: Is the Media Glamorising Malala? Where ever you go in the world Malala seems to be the talk of the town. Use the Google search engine and typing the name Malala gives you instantaneous accounts of articles, images, speeches, even list of solidarity walks, candle light vigil events, remembrance songs and petitions making her a symbol of female emancipation. The leading politicians of the world, celebrities, dignitaries, presidents and leaders are all being lined-up to put on record their admiration for her. She is the first ever Pakistani Muslim female that has risen over and above the Pakistani political elite to have advised the American President on policy issues such as ‘America’s Drone War’ considered to have been the most controversial of its kind that has attracted the indignant wrath of the intellectual establishment in the United States of America. Celebrities from all walks of life have been trying to catch a glimpse of Malala at numerous events and none more so than former British PM Gordon Brown, actress Angelina Jolie and UN Secretary General Ban Ki-Moon who has labelled her as “Our Hero, Our Champion” in essence confirming the emergence of a new political icon. Right across the world Malala’s birthday July 12th has now been officially designated by the United Nations as ‘Malala’s Day’ whilst her long list of awards and prizes have put her ahead of several western intellectual luminaries , campaigners, and activists such as William Wilberforce, Thomas Clarkson and Olaudah Eqiano whose combined media coverage and written work has received far less recognition compared to the attention Malala has received in recent times. The American Foreign Policy Magazine has ranked her ‘sixth in the world top 100 thinkers’ last year whilst the most prominent global media outlets have published thousands of articles, images and sounds bites making her more influential than the British Royal Family. Steve D. Holmes writes in Huffington Post comments section, ‘She is not the future voice of moderate Islam. She is an articulate and very brave young girl but she is not a religious scholar or leader. In fact any effort from “the west” to inflate her importance will backfire and in some circles they are already calling Malala a western stooge. Marketing the Malala brand in this manner leads us to the conclusion where the vast majority of people have lost all sight of reality compounded by the fact that we are living in an age where a five year old knows much more about computer technology compared to their peers. Now the fundamental question that strikes a chord in the heart of every educated person’s mind is whether the Muslim world embraces this campaign? Given the circumstances that sales of her autobiography will go through the roof, maybe it will attract the attention of people who have purchased the number of copies of the Harry Porter book series or the Irish football legend George Best’s Blessed: The Autobiography. The icing on the cake will undoubtedly be when Hollywood, Bollywood or the BBC and CNN come calling and in the process make irresistible offers to produce films and documentaries on her life. Malala is indeed an emerging face of Pakistan, the youngest ever nominee of the Nobel Peace Prize in its history and since then nearly a million people have signed a petition at the BBC website endorsing her brave stand. It is yet another illusion that those behind this campaign are also involved in drone attacks, displacing civilians, kidnapping, torturing and engaged in the promotion of state terrorism across the world. Yet no one today bemoans the fate of millions of Iraqi children who died as result of harsh American and Western sanctions in what can best be described as nothing but a phoney war. The wisdom behind the French philosopher, Jean-Paul Sartre refusal to accept a Nobel Prize in Literature in 1964 was that the French committed vicious atrocities in Algeria; his standpoint conveys that in the struggle against the unjust, awards hold no value and it is ultimately the truth that is invariably worth everything in the long term. But what these news organisations, politicians, writers, activists and members of the public are failing to take heed of is the ruthless abduction, harassment and the subsequent killing of five Pakistani journalists from the same region as Malala for their principle stand against injustice by the same Taliban, who according to Joe Biden are ‘Taliban per se not our enemy’. To many critics, journalists and scholars like the American independent radio host Alex JonesTaliban’s are nothing more than bogiemen. Those at the UN observing Malala’s day with such pomp and grandeur are doing a disservice to the millions of other similar victims across the Atlantic in the theatres of conflict ranging from Somalia, Iraq Afghanistan, to the ghettos of emerging economic superpower India and crisis ravaged Pakistan, where children have to walk miles to get to school, undertake odd jobs in houses, hotels, collect and sell scrap to fill their stomach. Not only has the media seemed reluctant to report the plight of two other innocent girls accompanying Malala who were injured in the Taliban onslaught but also never talk with same strength of mind for teachers who were either killed, brutally beaten, harassed and disrespected publicly in Pakistan not once, not twice but on numerous occasions, where schools in villages are turned into stables and education has inevitably become a commodity of the elite. Those in the West chanting slogans for Malala were once behind the systematic demolition of the education system in the Indian Sub-Continent that was partitioned into two new states India and Pakistan respectively. Imran Khan aired his concerns on the actual merits of the dual system of education in Pakistan via his book Imran Khan Pakistan: A personal history he writes, ‘the elite wanted to maintain the privileged position in society that this unfair system gave them’. Tariq Ali, a prominent journalist and author, discusses this issue in more detail which to him dates back to the British presence in South Asia, in his interview with Harry Kreisler, host of Conversation with history, at the University of Berkeley. Further to this, the Lal Masjid (Red Mosque) massacre received scant coverage in the western media that amounted to more than a few pieces that appeared in liberal publications such as The Guardian and The Independent. It is at this point that we can rewind the tape and argue that personalities such as Ghulam Murtaza Malik, Hakim Saeed, Allama Syed Irfan Haider Abidi and many other scholars and academics were brutally killed in troublesome Baluchistan and elsewhere by extremists, yet no one signed a single petition to protest at such heinous crimes being committed in the motherland. Notably the same media organisations have dedicated their front pages to the cult of Malala, making provisions for her petitions are actively discrediting those five journalists who have gone through similar yet harsher situations that led to their very lives being taken by the Taliban, including the BBC’s own journalist Hayatullah Khan, now a forgotten soul. What do we say to the soul of Muzaffar Ali Khan, member of Swat Qumi Aman Jirga, (Sawat National Peace Committee) and others who gave their lives, never received any recognition or headlines in the process and have not even been blessed by people lighting a candle for them? Our intention is not to discredit Malala who of course has emerged from the shadows as an icon of courage and grace but to point out an important media related issues namely: Framing! Malala is yet not alone in voicing women’s freedom, their right to education and liberty. In this new world of information, she is one of the thousands of online diarists or bloggers, who discuss, lobby and debate matters relating to education in the world. One recalls a discussion led by Prof. Michael Rowels on the MA Journalism course, appreciating the description of an Iraqi anonymous girl who started writing a blog ‘Baghdad Burning’ under the pen name ‘Reverbend’ from an undisclosed location in Iraq disclosing to the world the invasion of her country which later became one of the best selling books in the literacy circles in America and Britain. Despite all the glamorous, inspiring words and eulogies she [anonymous blogger] fails to acquire a place amongst the western political and social elites. Here we ask what has stopped this girl and her tragic story of anguish when attempting to win over the hearts and minds of the people. Petitions, awards, memoir and rallies were nowhere to be seen as in the real world powerful nations and organisations have their own standards: where the unthinkable becomes the thinkable. All these episodes once again echo media ‘framings’ and reminds us of the number of events around the globe what William Blum describes in his analyticvolume Rouge Sate: A guide to the World Only Super Power (2000) ‘False Flag Operations’. So is this what journalism is going to be! Who can forget Nada Aga Soltan? She was an Iranian girl, who was killed during the bloody post election violence protests in 2009 in Tehran. Her video was on Youtube as well as other Western media outlets, within minutes around the world, and went on to receive the George Polk award. In stark contrast, the same media moguls blatantly chose not to publish a video of Ian Tomlinson slowly dying as a result of the British police brutality during the G-20 protest in London the same year. This sends a strong message to all of us that the media wields the power to frame issues in any way that it thinks best suits its interests.